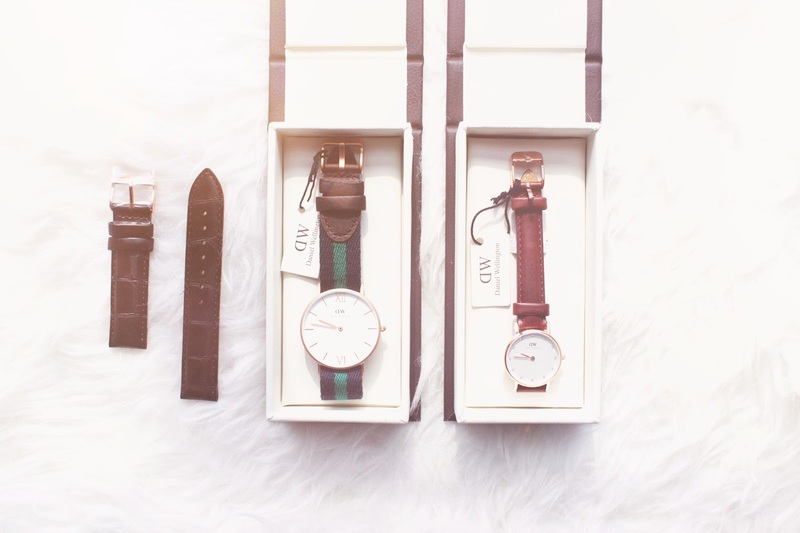 ecently I have bought 2 watches from Daniel Wellington; I have always been a fan of their watches because I love the classy and simply style of their watches. I know Daniel Wellington watches have been a hit for a while, but I am not necessarily a watch-person, so I have been thinking this through for quite a while. However, I just couldn't resist their designs and bought one leather-strap watch, and another fabric-strap watch for my boyfriend on his birthday. Now, I am wearing this watch every single day and I am absolutely loving them at the moment. The leather-strap watch I bought is in the size of 26 mm, as I have a very small wrist. The only thing about a 26 mm watch is that they don't provide much alternative straps for your watch, unlike other sizes like 36 mm or 40 mm (they are way too big for my wrist). But everything else of this watch is perfect, personally I am a leather-person, so I chose the leather strap "classic st mawes" and the watch with Swarovski crystal as a time indicator. The watch is basically flawless with its rose gold color (you are able to choose either silver or rose gold). The other watch I bought for my boyfriend is called Grace Warwick 36 mm, what I love about this watch is its sandblasted rose gold edge and the Roman numbers that only the Grace collection have. It also comes with a strap in a merge of fabric and leather. Other than the watch, I also bought him another leather strap to go with the Grace Warwick, the leather strap is called Classic York Wristband with a print of crocodile pattern. 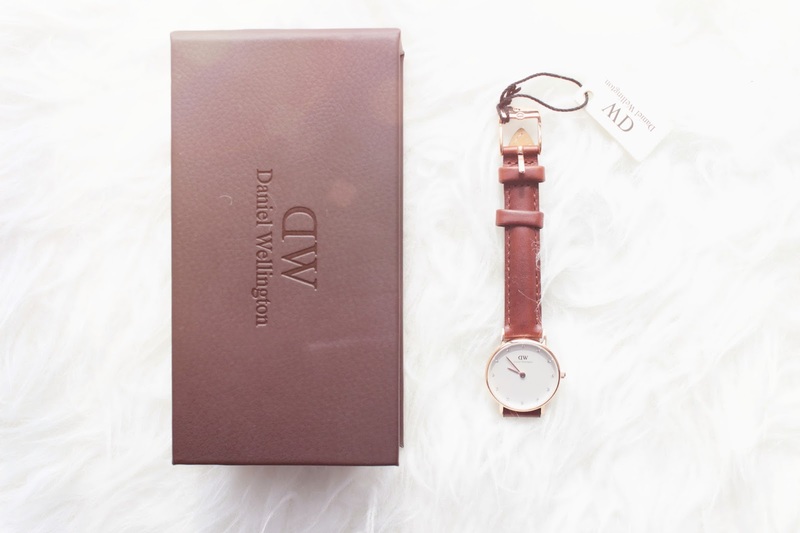 As you can see from the photo above, Daniel Wellington mainly goes with a very simple style, so it basically goes with every outfit. With different straps you can pair with, your watch can actually last a very long time if you take a good care of it. 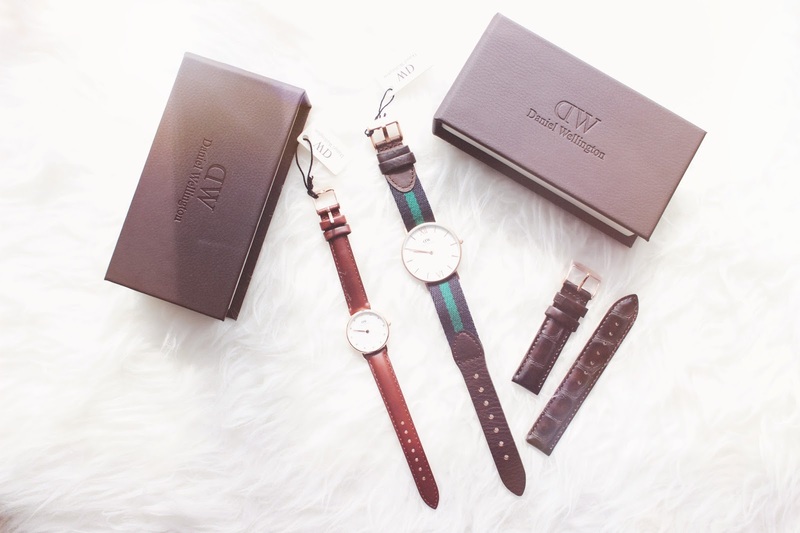 Another thing I love about Daniel Wellington is that every single watch comes with a beautiful leather box, also a pin for strap-changing. The watch is absolutely amazing and I would definitely recommend everyone of you who is reading this post to purchase it, it is absolutely worth the price and you will never regret it with its combination of different straps and styles. Also check out my recent post for a free promo code for 15% OFF, to purchase an outfit that goes along with your watch!